MT. LEBANON, Pa. — In a hilly stretch of Pittsburgh suburbs that helped deliver President Trump victory two years ago, both parties are closely watching a competitive special election on Tuesday for signs of whether support for Republicans in the heartland is eroding. Democrat Pam Iovino, a Navy veteran and former George W. Bush administration official, is trying to rerun the playbook that elected Democrat Conor Lamb to Congress in solid Trump territory last year. 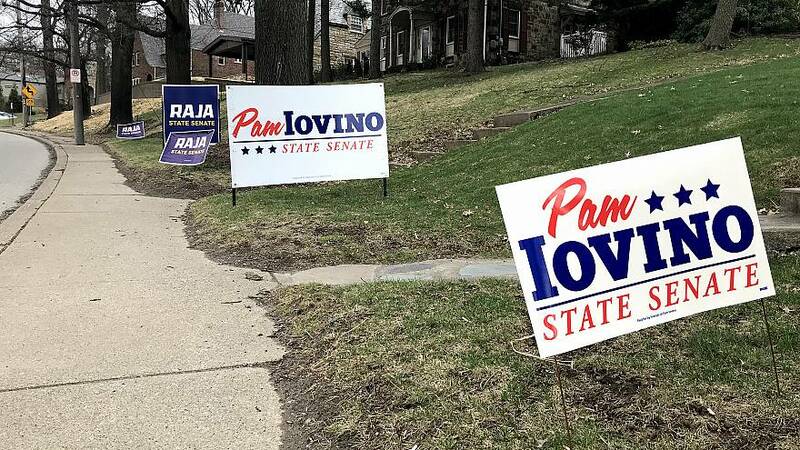 Iovino, like Lamb, casts herself as centrist and independent, and the state Senate district she's seeking overlaps heavily with Lamb's southwest Pennsylvania district. Republican D. Raja, a software company founder who goes simply by "Raja," is emphasizing his background as an immigrant from India who achieved the American Dream, just as Republicans nationally are watching the Democrats highlight the diversity of their candidates in an attempt to draw an unfavorable contrast with the GOP. It's the first major bellwether race since the 2018 midterms, in which Democrats took control of Congress by flipping seats in precisely the same types of places as Pennsylvania's 37th Senatorial District: industrial, blue-collar areas of the heartland where the voters are disproportionately white and changing economic winds have swept away many of the jobs of the past. The seat has flipped back and forth among Democrats and Republicans over the years, held most recently by Republican Guy Reschenthaler, who resigned after being elected to Congress in November. Trump won the district by six points in 2016 but it swung left in the 2018 midterms, voting to handily re-elect Sen. Bob Casey and Gov. Tom Wolf over Republicans who backed Trump's agenda. Both candidates have tried to nationalize the race through their attacks on their opponent. Democrats sent out mailers showing Raja with a silhouette of Trump's face as his shadow and reminding voters of nice things he's said about the president. Raja ran a television ad showing Iovino next to photos of Sen. Bernie Sanders, Rep. Alexandria Ocasio-Cortez and House Speaker Nancy Pelosi and accusing her of having "teamed up with extremists" by backing "billions in new energy taxes." "Three strangers to me," Iovino told NBC News in an interview during a break from canvassing in Bethel Park. "I found it almost trite, like you pull a play out of a file drawer, slap the Democrat's face next to it and make a television ad. It doesn't mean anything." Emphasizing her military background — she served 23 years in the Navy before President George W. Bush nominated her to be assistant secretary of Veterans Affairs — Iovino has drawn parallels between herself and Lamb, who became somewhat of a hero to Rust Belt Democrats after his long-shot victory last March. He's been campaigning this year for Iovino. "Pam Iovino is not a Conor Lamb. Her policies are very, very different than Conor Lamb," said Raja, pointing to guns and abortion. Lamb, who served in the U.S. Marine Corps, opposed new restrictions on owning guns and voiced personal opposition to abortion during the campaign, though he didn't support overturning Roe vs. Wade. In the sole debate this year, Iovino emphasized the right of women to make decisions privately with their physicians and backed restricting ownership of semi-automatic weapons. But whatever the key to winning in these areas, it's of utmost importance to Trump, who carried Pennsylvania in 2016 by just 44,000 votes, the first Republican to do so since 1988. He needs to hold Pennsylvania and repeat his unlikely wins in Michigan and Wisconsin to win re-election. Democrats gained a net of three U.S. House seats in Pennsylvania in 2018, bringing the state's congressional delegation to an even 9-9 split, and narrowed their gap with Republicans in the state General Assembly. Democrats have ousted other Republicans in state races in Ohio, Michigan and Wisconsin, raising hopes that their prospects are brightening in the Rust Belt. This month, Emerson Polling found Trump's support dampening in Midwest industrial states, losing in a hypothetical matchup with Joe Biden or Sen. Bernie Sanders in Iowa, Michigan and Wisconsin. Yet Democrats have suffered their share of losses as well, including a string of four other special elections for state legislative seats this year. Although those losses were a warning sign for Democrats, they were concentrated in states like Connecticut and Louisiana seen as less vulnerable to flipping on the presidential level in 2020.So the party is looking to a win in Pennsylvania on Tuesday as a clearer sign that the momentum they perceived in battleground states in 2018 is carrying forward as the party gears up to dry to defeat Trump next year. At the Galleria mall in Mt. Lebanon, Kristy Nolen said her disgust with what Trump and Republicans were doing nationally did weigh on her decision in the special election. The 47-year-old comedy theater manager said she planned to vote Tuesday for Iovino. "Maybe in another year I could have taken a look at their guy and said, 'Yea, maybe,'" said Nolen said of the GOP. "But given what we've been through the last two years, I can't. I can't imagine opening up any opportunities to Republicans at this moment." "Personally, I mean, he has issues," Main said. "But as president, I think he's doing a great job." In battleground areas that favor more moderate candidates, there's a danger for Democrats as well, stemming from a national Democratic political scene that is spotlighting more outwardly liberal politicians, particularly as the 2020 primary field takes shape. Trump has led Republicans in seeking to apply the label of "socialist" to Democrats up and down the ballot in a bid to paint them as too extreme. Asked what it means to her to be a Democrat in 2019, Iovino paused for 13 seconds before ultimately responding: "I think I can only best speak for myself." She said the Democratic values on which she was raised centered on education, hard work and the opportunity to fulfill one's potential. "I think it's very far left," Raja said when asked to describe the Democratic brand. "It's socialist. That's what it's become." He summed up his own party's brand in 2019 as "every worker in the country." 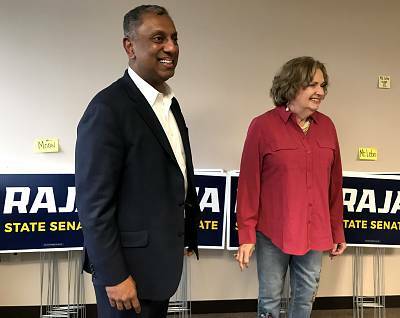 "That is the change right now," Raja said in his campaign office, surrounded by campaign t-shirts and yard signs piled waist-high. "We represent the trades, we represent all of the hard-hat jobs. It's everybody who wants to work." It's a message Democrats worry could be effective for the GOP if the unemployment rate, now 3.8 percent, stays low heading into 2020, having fallen since Trump took office. And so many Democrats are working to portray themselves as pragmatists who can work with either party, knowing many of the voters they'll need to win are ones who voted for Trump. 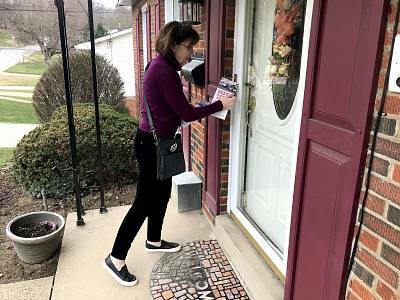 As she knocked on doors with flyers and lawn signs on the last weekend before Election Day, Iovino approached a modest one-family home in Bethel Park where a young man urged her "not to be hijacked by an extreme philosophy on either side." "I think you saw it in the presidential election," Iovino told him, "where if you were a Democrat, you saw our candidate get pulled too far to the left. It was not where really she was." The voter agreed, and though he wouldn't commit to voting for her, he asked for a third time how she planned to bridge the partisan divide where so many else have failed. "If you can do that," he said, "you have a chance at my vote."